Looking for dates and links to registration sites? That’s just below. If you want to book a workshop or series for your group or venue, in-person class descriptions are further down this page. Please email me to discuss dates and how I can tailor a program to your needs. New Age Looping is a contemporary interpretation of an ancient technique so logical you don’t need to follow a pattern, and relaxing to work even when you expect frequent distractions. Workshops emphasize tension control and structural understanding, and help students at all levels learn to design their own projects. Variations are introduced in a progressive fashion and may include knotless and knotted stitches, combination and grouped stitches, skipped stitch patterning, needle entry positions, shaping options, complex looping, bead looping, and looping over a core (a.k.a. Fuegian coiling). Workshops can focus on a particular variation, like Cross-Knit Looping. As time allows, students may learn to dye and paint their own yarns and threads. Sometimes called Coptic knitting, Tarim stitch or Viking knit, at a glance cross-knit looks like stockinette stitch in knitting. But this versatile looping variation is worked with a single needle, with the entire length of thread passing through each stitch. It marries beautifully with weaving, knitting, crochet and felting, and handspinners love it. It’s great for joining and reinforcing edges (use it to cover a multitude of sins). Use it also to create incredibly stable tabs, panels, pockets, gussets and other fun and functional insertions and add-ons. Includes a Powerpoint program and a guided tour of the sample collection I’ve been building for 15 years. Your group will handle pieces worked in different threads and yarns to discover the range of possibilities from this timeless technique. Guilds may combine a lecture with a half-day hands-on Intro to New Age Looping on the same day. Using a shuttle and gauge to work a knotted form of looping, learn to work diamond mesh netting. Start from a foundation chain and work flat to create scarves, shawls, hammocks and more, or from a grommet base and work in the round to make shopping bags, fishing nets, hats, and other 3D forms. As time allows students explore square-mesh netting and patterned or “fancy” netting. 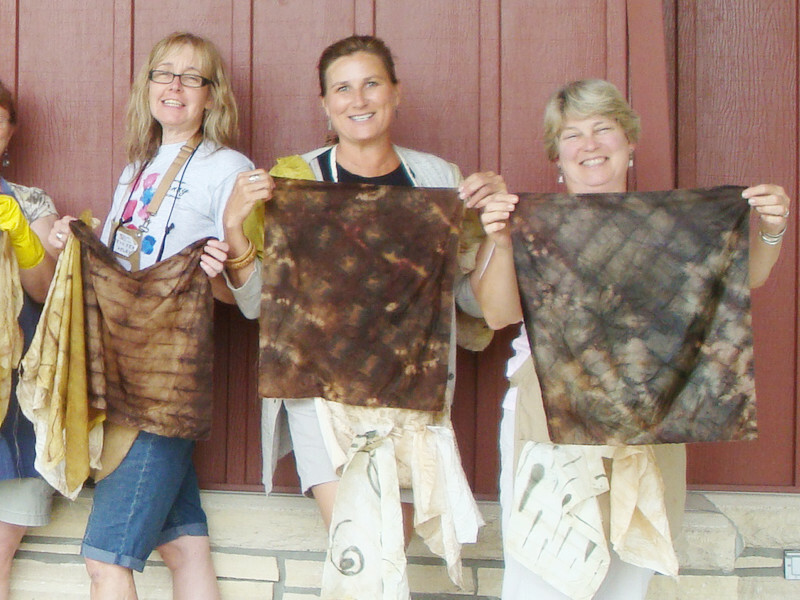 Explore natural dyeing and printing on fabrics and yarns using plant materials commonly found in the Upper Midwest. Working with fresh, frozen and dried twigs, leaves, blossoms and barks, you’ll sample hot and cold bundle dyeing and color extraction for immersion dyeing. Eco-friendly mordants and modifiers help produce a range of colors. 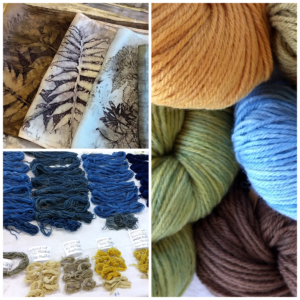 Classes include information on wild-harvesting and growing (even in limited space) for a sustainable supply of natural dye material. Contact me to schedule a workshop for your guild, group or conference.